The Brick Castle: Scholastic Books Spring Bundle Giveaway & #KeepReading Competition! Scholastic Books Spring Bundle Giveaway & #KeepReading Competition! 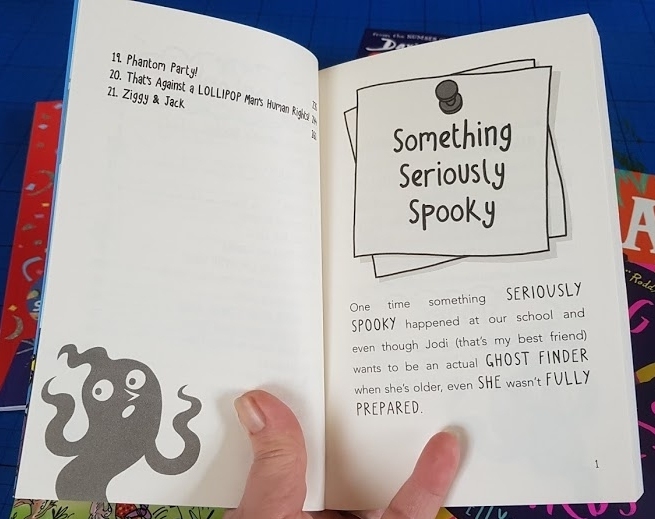 World Book Day may have been delayed all over the country due to snow, but Scholastic were on time in releasing their special World Book Day Book Club catalogue. Including over 400 carefully chosen books from more than 70 different publishers and a host of amazing authors, the price of everything in the World Book Day Club catalogue is also heavily discounted by as much as 70%. 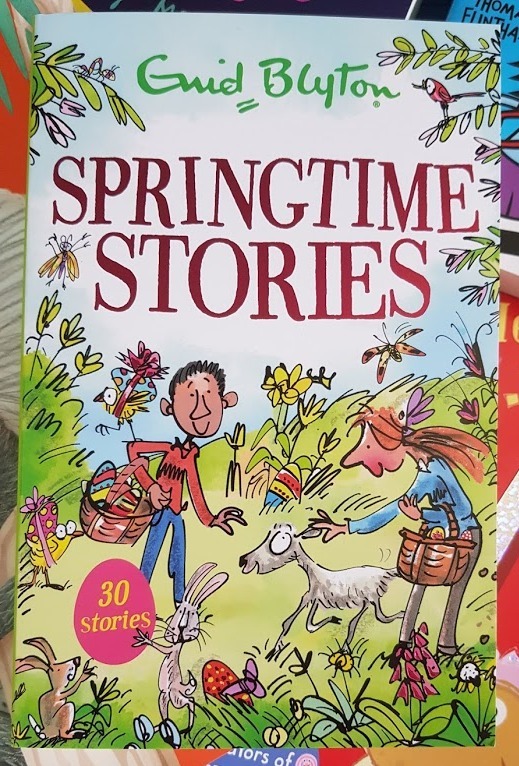 To help promote the Spring catalogue and celebrate World Book Day, Scholastic have a fabulous #KeepReading competition with a chance to win £30 of books for your child AND their school or nursery. Scholastic are inviting children to send in a video or written review of a book that they have recently enjoyed. 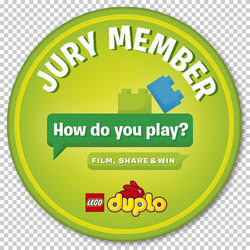 There are three different age categories, 0-6, 7-11 and 11+, with one prize for each category. 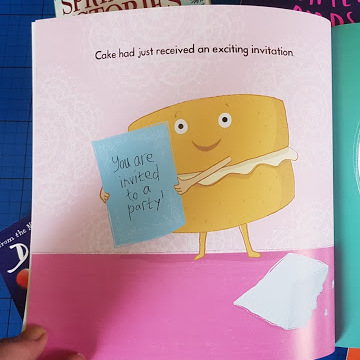 It doesn't have to be professional, and it doesn't have to be a particular book - but it does have to be the child's review, not yours! 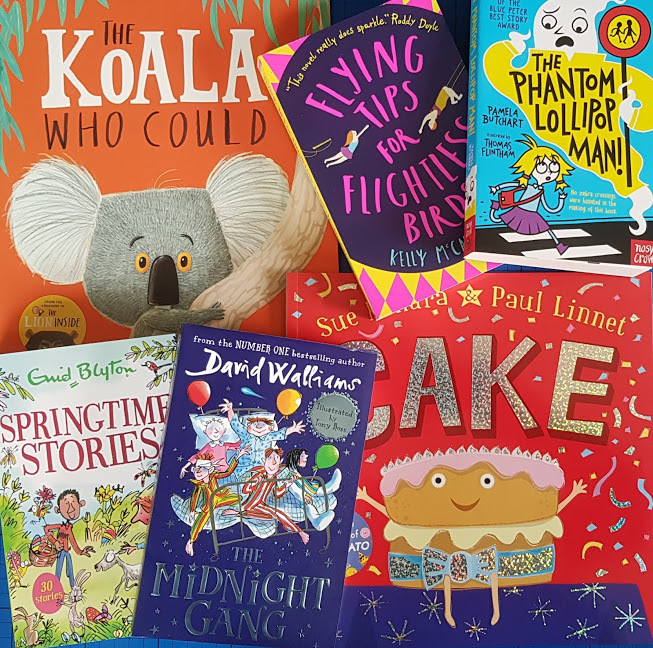 The three winners will be able to choose £30 worth of books for themselves and nominate their chosen school or nursery to receive a £30 credit to their Scholastic account, which can be exchanged for free books. 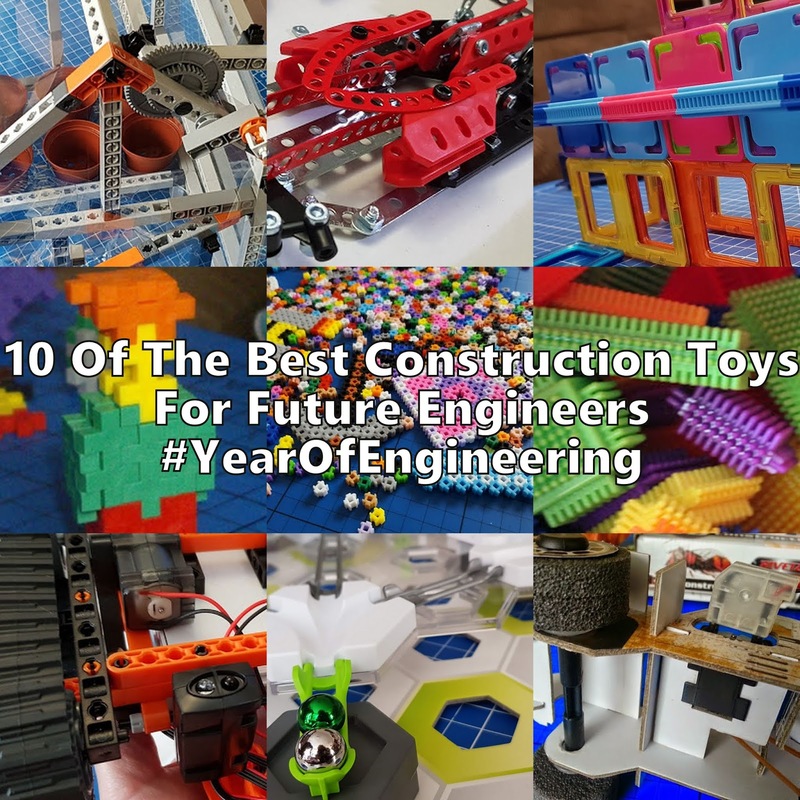 Entries need to be received by midnight on Thursday 29th March 2018. My almost 8 year old says: (Laughing) The cake is trying to get to the birthday party, and they trick him. It's a good story. My 9 year old says: I think it's more for younger ages, but I still really enjoyed it (he laughed aloud as he finished the book). 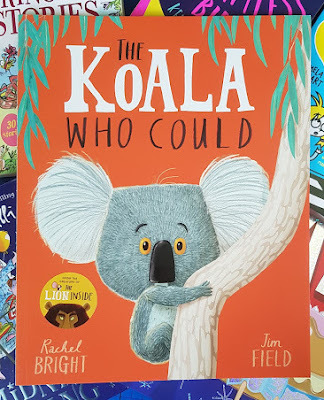 A large format paperback by Rachel Bright and Jim Field, written in rhyming couplets and with 32 full colour pages. 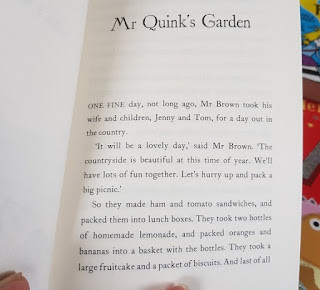 Suitable for reading together or for young independent readers. A fantastic story about Kevin the Koala. His worst fears come true, but actually, it was okay and it really alters his entire life for the better. An excellent book to really encourage nervous children or those who are scared of change. My almost 8 year old says: He is stuck on his tree and it comes down and he can enjoy everything forever. 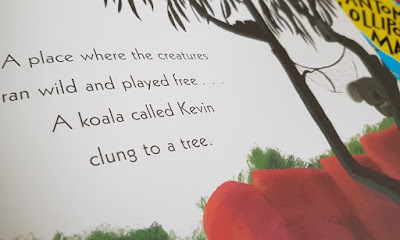 My 9 year old says: I like this book because it has a message in the end - and it's about one of my favourite animals. The moral of the story is to enjoy life. 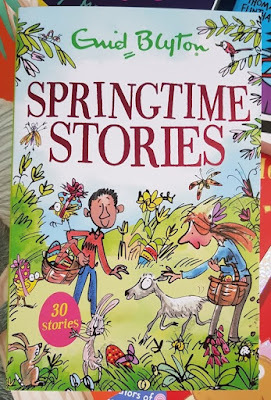 A collection of 30 classic short stories from Enid Blyton, with cover art by Mark Beech. Suitable for reading together or for young independent readers aged around 6+. A big paperback with 320 pages, but each story is very short and quickly read - perfect for bedtime. 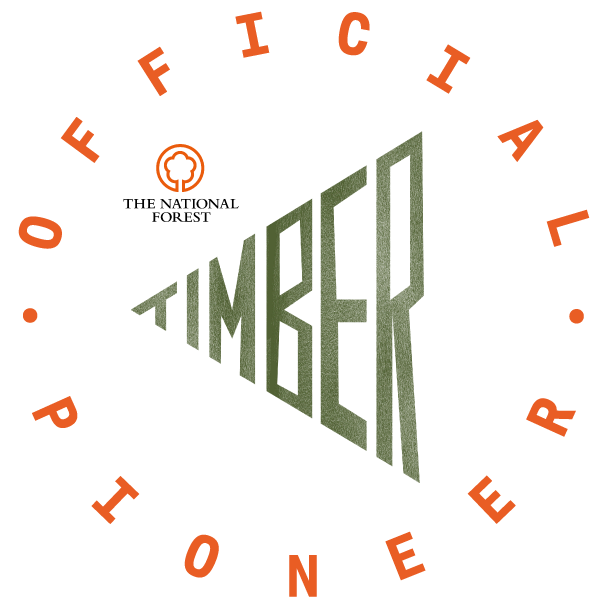 This genre fell out of the spotlight over the last 30 years, but they are coming back into vogue and I think it's a good thing. The love of the outdoors and innocence of the characters within the stories has been missing from recent children's literature. Rescued kittens and lambs, painted eggs and home-made lemonade, it's all there. Let kids be kids while they can, they'll be adults long enough. My nearly 8 year old says: It looks good. I'll read these stories. My 9 year old says: Fairy tales. I think I would like this because I really enjoy fairy tales and fantasy. Lots of short stories sounds good. My nearly 8 year old says: From the cover I really don't want to read that. Oh, actually it's different inside, its got lots of pictures. The blurb looks good, but I don't like ghosts. My 9 year old says: I think this looks great. It involves science and comedy. 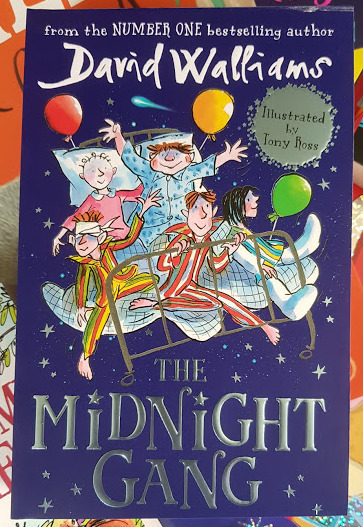 Written by David Walliams and illustrated by Tony Ross, we first looked at this in the December 2016 Scholastic catalogue, and it was the first book my 9 year old son chose when he got hold of them. He really enjoys David Walliams, whereas my almost 8 year old has only just become brave enough to tackle it. 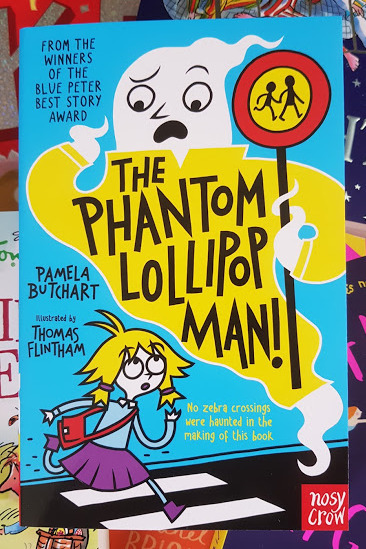 A great midpoint between the comic style of books like The Phantom Lollipop Man and the full on chapter novels with no illustrations. 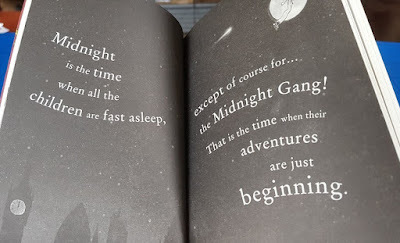 The midnight gang are a bunch of children who are staying in hospital, very bored and mischievous during the night! I really like this one. A whopping 480 pages, yet perfectly achievable and a great read for any child aged around 9+. 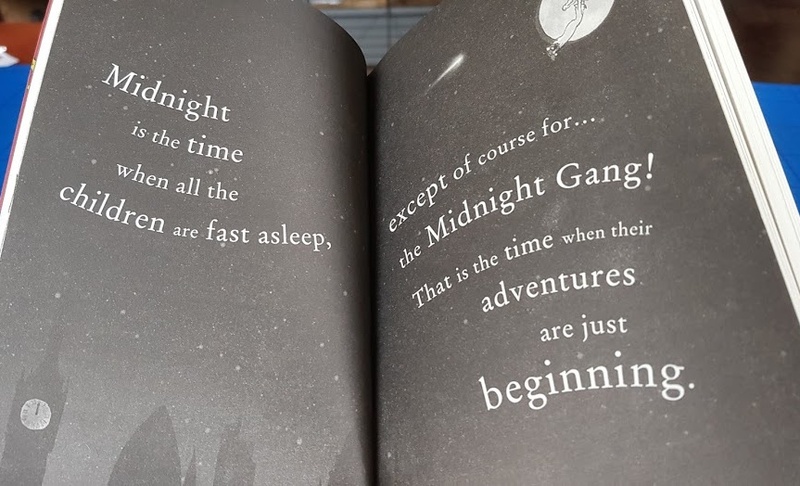 My 9 year old says: I like The Midnight Gang because there are so many main characters and each of them has their own disability. It's a really good story. 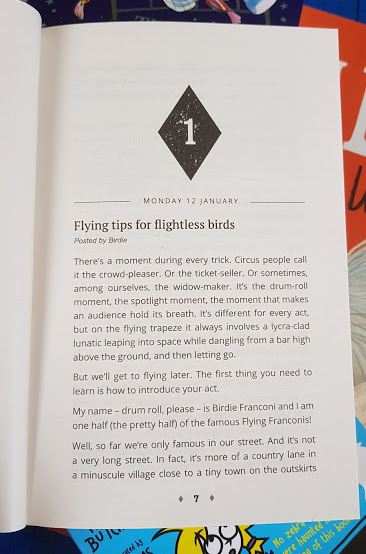 Flying Tips for Flightless Birds (£7.99rrp, Scholastic price £4.99). 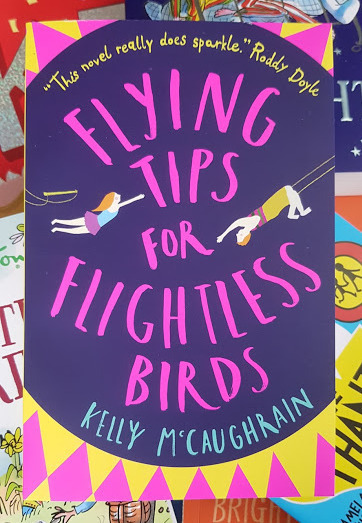 Kelly McCaughrain's full 380 page novel for independent readers aged around 11-12+. This is the tale of Finch and his twin sister Birdie, their family Circus School and how their lives change when Birdie has a really serious accident. A great book for any young person feeling that confusion over 'who am I?' as they enter their teenage years, with a rites of passage story which covers teenage worries, emotions, sexuality and early loves very sensitively. Ideal especially for any young person struggling to find characters to relate to. My 9 year old says: I don't know if this is the sort of book I'd read because I prefer fantasy at the moment. (He has plenty of time yet). 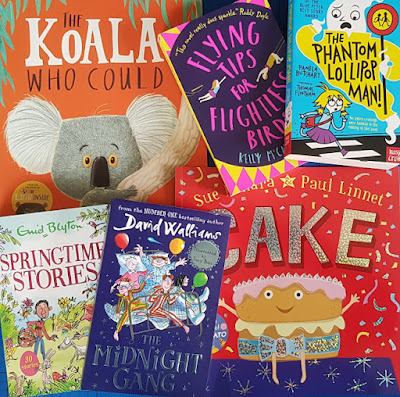 When you shop with Scholastic they will also donate 25% worth of FREE BOOKS back to your nominated school or nursery for every order over £10. Last year they gave over £9m in free books back to schools - make sure that yours is registered and if it isn't, ask at the office because registration takes only a few minutes. 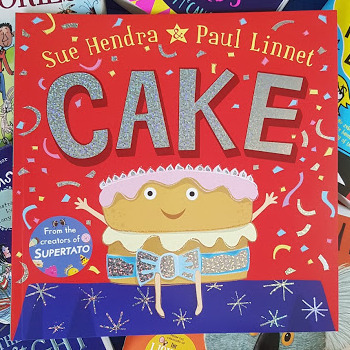 To take a look at the full World Book Day Book Club, (where you can search by age and type of book) on the Scholastic website. And don't forget to enter the #KeepReading competition! Scholastic have offered this bundle of 6 excellent new books for one of my readers. Entry to the giveaway is by Gleam form below and the giveaway will end at midnight Sunday 8th April. Open to UK entrants only. 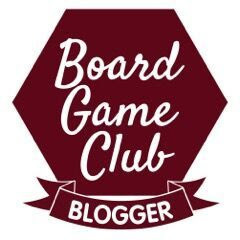 To see my other giveaways, please go to my Giveaways Page - where you can also find help if you are new to Gleam forms. We were sent our books for review. I look forward to some sunshine so that I can get outside and make my garden beautiful again after the winter. The warmer weather. I can't wait to go outside without a coat and enjoy the sunshine. Warmer weather so I can get my chihuahua out - she hates the cold weather! Getting outdoors more and spending time in the garden. Love coming home and opening the doors to the garden with the sun coming through. I look forward to not having to put so many layers of clothes on, so I can get ready quicker! Same as most people Spring sunshine & warmth, not happening yet though. An end to short, wet, windy and cold days when the warm sunshine finally breaks through. Lovely! I look forward to baby animals being born, watching the little ducklings swimming behind their Mum in a straight row does it for me every time! I look forward to the blossom on the trees! I love it when all the green shoots start to appear and I know my plants have survived the winter. I look forward to lighter nights, so I can take the kids to the park after school. The warmer days and the spring flowers. Warmer weather, as allows for getting outdoors and enjoying being outdoors. Lovely to see flowers, plants, trees, hear the birds chirping , etc. It's like life, fun, joy, new beginnings. I love seeing all of the wild flowers start blooming and the wild bunnies running around. Getting back out in the garden, to prep for all the summer flowers and fun! Lighter evenings, warmer days, getting outdoors with the kids. Bliss!!!! The sun making an appearance! The sunshine definitely! and longer days so I can stay outside for longer! Easter holidays with my kids, Easter eggs and my birthday. I look forward to getting into the garden and seeing everything blooming. I look forward to the weather warming up, with the promise of summer on its way. Walks in the woods and along the beach are so much fun in the spring time, looking for all the spring wildlife. The warmer weather meaning we can get outside after months of rubbish weather. What do you most look forward to in Spring and why? I always looks forward to the longer days and the Easter holidays. I look forward to the Spring flowers - crocus, daffodils, tulips because I love to see them. We like walking by the riverside with the dogs. I enjoy the warmer weather mostly and enjoy walks and cycling with my family. Great for our mind and health. I most look forward to seeing the spring flowers and the warmer weather. I love the tulips and Daffodils all around, picnics in the park and more chances to get out for a bike ride! Love seeing the colours on threes changing. 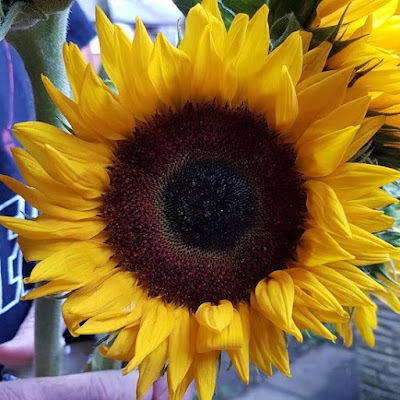 Sunshine and pretty flowers for me!!! Great bundle, we look forward to being able to get out on our local bike trails a bit more without freezing! I look forward to lighter evenings, because it make it perfect for a lovely evening walk or a spot of gardening. I love to see the blue bells because they are my favourite flowers! The lighter evenings so I can fit in a run around the fields once the kids are in bed. It's so nice to get off the pavements after a cold, dark winter. I look forward to the warmer weather because I spend most of the winter feeling cold! i love the lighter nights, it just makes me happier and no more feeling grumpy about when it's dark and cold. I love rock pooling with my great-niece who is 5. It is a bit cold in the winter and rather busy in the summer so we prefer spring for it. I'm not a winter person at all and my niece doesn't really like the outdoors however my nephew does - spring makes it so much easier as at least it's bright outside so we can walk to the park together and have fun there. The flowers blooming - reminds me of new beginnings. Also love the longer days cos there doesn't seem there's enough hours in the day so as more sun light is always a bonus. i look forward to seeing the daffodils sprouting, because they make me happy when they dance in the breeze. I love to get in my greenhouse in the Spring and start planting all the seeds for this years crop of vegetables and flowers on my allotment and i just love to see all the wildlife emerging after the winter. I find that the winter seems really long in Scotland so it's nice to go to work and come home in the light. Everything looks bright and more colourful - love the spring flowers. Getting out in the fresh air and seeing all the flowers come into bloom. getting in the garden, i'm going out in a min! I look forward to the lighter mornings. It's nice to leave for work at 6am and have some light! I look forward to it getting warmer - it means summer holidays are on the way. 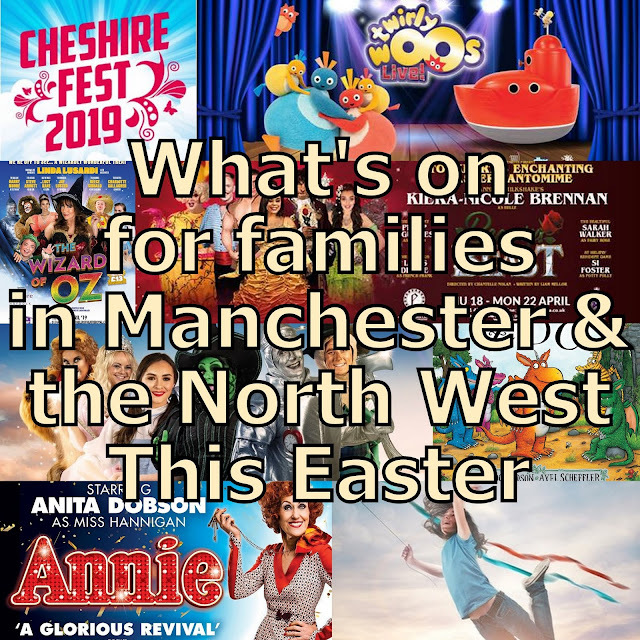 The longer days so get to spend more time with my 3 daughters, their school is not local to us which means that by the time we get back home in winter it's food, cuddles and bed so summer is our time to shine as a family. I look forward to lighter evenings and blossom on the trees! I look forward to the garden looking pretty, lots of colour and the grass hopefully starting to grow back! The Daffodills bringing a splash of much needed colour back into the dreary days. Getting my garden sorted and actually getting to spend some time in it! I love seeing the ducklings and goslings on the canal. It really brightens up my walks and is a good way to get the kids out too. The warmer weather. It makes everyone feel that bit happier.